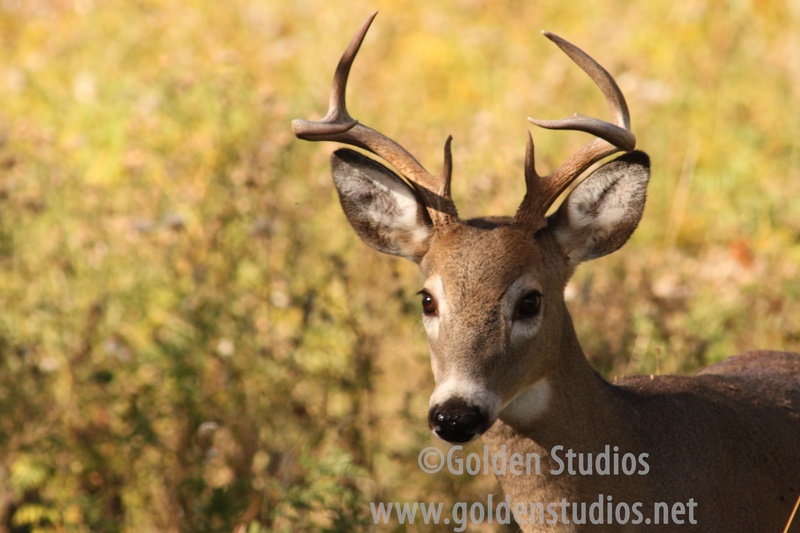 goldenstudios.net | Golden Studios… home to nature photographer and writer Virginia Parker Staat. This photo always brings a smile when I see it. I took it at Custer State Park in South Dakota in 2010. I consider it my best deer shot… and I don’t even remember taking it! It was our first visit to Custer. David, Roxanne, and I had spent two days in the park, hiking and traveling around the wildlife loop. Custer is known for its herd of “wild” burros so tame that they will shove their noses into your vehicle in search of a hand out. We were fortunate to find the entire herd along the roadside. I literally took hundreds of photos. As we drove back to camp, we spied two buck along the side of the road. I rolled down the car window and snapped a few shots with the camera. That evening we downloaded the photos to see what burro antics I had captured, never even looking at the other images. It wasn’t until we returned home (nearly a month later) that I discovered this photo of the buck. I actually gasped when I saw it. It has become my best but least memorable deer photo. I call it El Ciervo de Oro which translates to the golden stag. 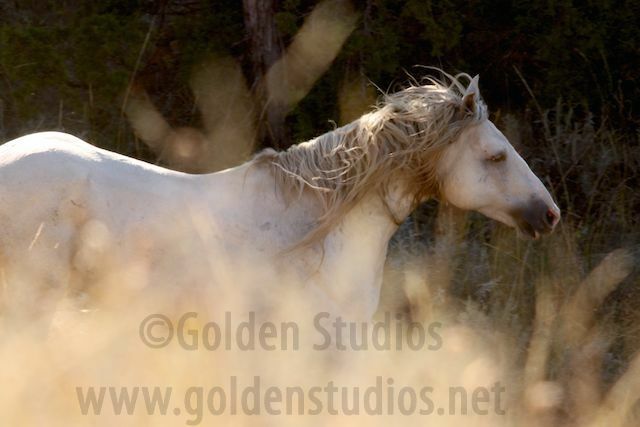 This stallion is the first wild horse that I ever photographed. Called Grey Ghost by the rangers, the stallion leads a band within Theodore Roosevelt National Park in North Dakota. After discovering wild horses on our first visit to TRNP in 2010, David and I made a second visit to the park the following year. We arrived with high hopes of photographing wild horses again. To our dismay, we discovered that the park was using helicopters to dust herbicides for nonnative weeds. Of course, wildlife was scarce and skittish. When we found the band, I was more than excited. I was in a fairly good position to take photos, the sun was behind me, and the morning light was perfect. Slowly, I inched closer to the band, using sagebrush for partial cover. The horses were obviously aware of me but continued grazing peacefully. As I inched closer, I began taking photos. Suddenly, the sound of a chopper came tremendously close, startling us all. The horses went on high alert. The chopper rose out of a gully not more than a hundred yards from us. The stallion turned and gallantly stood to take on this huge metal beast while his boss mare led the band to safety. Only after the entire band had fled did the wounded stallion turn to save himself. My heart broke as we watched him limp out of sight. In spite of the moment, I was able to raise the camera and take this one shot of him. I am happy to report that during our third visit to Theodore Roosevelt, we found the stallion healed and still in charge of his band. Although this photo is a bit blown out around his haunches, it remains one of my favorites because of the story behind the photo. I was still shooting film when I took this photo. We had decided to celebrate one of David’s milestone birthdays by renting a beach cottage in Surfside for the weekend. The next morning, we sipped coffee and watched the waves roll. 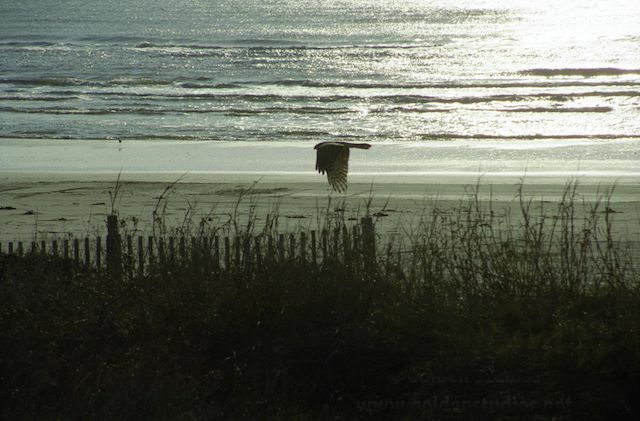 A hawk flew in, perching on a post at the end of the boardwalk, searching for breakfast. He was at least 50 yards from the cottage door. As we watched, I doubted that I could ever sneak up on him to get a photograph. Finally, I could resist no longer. I grabbed the camera and quietly made my way down the boardwalk. With my old Canon AE in hand, I knew I had but one shot before he flew. A quick prayer, a deep breath, and I rounded the boardwalk in full view of the hawk. He immediately flew… and I snapped once. I call the photo Beating Wings. After all this time, the photograph still amazes me. As a writer and nature photographer, the story behind the image is often the most important to me. Some stories can propel even a poor photo into something amazing. In the posts to follow, I’d like to tell you some of the stories behind the photographs. I’m looking forward to your comments! Welcome to Golden Studios’ new website and web home to nature photographer and writer Virginia Parker Staat. We invite you to view our gallery, to visit our blogs, and, most importantly, to enjoy our beautiful planet! All rights reserved. No images may be used without the expressed written consent of Virginia Parker Staat.